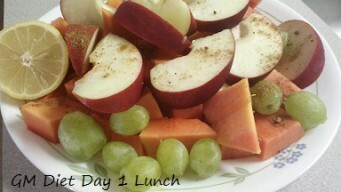 GM diet day 1 is about all fruits and no bananas. I did not lose any weight by the end of day. Body starts the de-toxification process with fruits today. Starting with GM Diet Day 1 today. Continuing on my resolution of testing the GM Diet, I have started eating ONLY fruits. Here is what I have consumed today with the pictures. I hope this will suffice with the requirements of the GM diet day 1 plan. 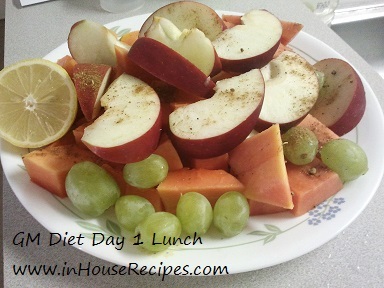 The idea is to avoid any starch and start the detoxification process by eating only fruits. Bananas are strictly NOT allowed. The sweetness will help satisfy the sweet cravings too. Here is what I ate today. 1 big Apple and 1 pear. Everybody in the home ate Omellete (My favorite) but I was successful in resisting!! 1 medium size Papaya sliced into small pieces.10 Green Grapes. Top them up with home made chat masala. On the other hand, I was undertaking mild exercise like climbing stairs couple of times and normal routine office work (Sitting and working on Laptop 80% of work time). Another good thing is that I had drank 5 glasses of water till 4 PM and was not feeling empty. May be its the mind that is able to control the hunger. Praying and hoping that I can survive the first day at-least!! I think the key is to keep yourself busy and away from food smell. If you sight food, change your way and try to involve yourself in any other activity. 1/4 pineapple. 1/2 musk melon. 1 glass of Orange juice. Juices are not allowed on day 1 and I took it in error. You should avoid it. I am feeling a bit of headache on the back of my head. But I am not taking any pain killer medicine. I think it is just normal to have this headache as a minor side effect of this sudden change in eating pattern. The body is expected to behave in this manner. Total 10 glasses of water consumed today. Hitting bed now. See you tomorrow. No weight loss today! Isn’t it too early to expect? Read my GM diet day 2 experience.